When Kiran Kataria arrived in Canada as a 23-year-old bride, she knew what good Indian food should taste like but she didn’t know how to cook it. She grew up in a home in Punjab with cooks and housekeepers. Before she was 30, she was a busy Mississauga mother of two sons, working full time and trying to keep up with the housework and cooking at home. Food had to be quick. It had to be nutritious. Most importantly, it had to appeal to the palate of her Canadian-born children, who weren’t wimpy when it came to spices, but who didn’t love the fiery stuff. A mathematician, Kataria approached learning to cook like a scientist. She studied spices and their flavours like they were a chemistry exam. She experimented at home, developing her own recipes, mixing Indian food with ingredients more familiar to the Canadian palate, including pasta sauce, olive oil and oregano. She learned to go easy on the cayenne. She calls it her R&D. And then one day, looking for storage for some mango chutney she had just made, Kataria’s husband Ranbir, an architect, grabbed an empty Heinz ketchup squeeze bottle and poured the chutney into it. Husband and wife stood together, looking at their creation. Chutney is the ketchup, mustard and relish of Indian food, says Kataria’s son and business partner, Rishi Kataria. It goes with meat, as a side-dish with bread, in lentil soups, with appetizers and kabobs. Why not sell it that way, as a condiment in a squeezable bottle, they thought. “We thought it would be fun,” says Kiran. The made $15 on their first sale, to an Indian store. Now their company, KFI, has 13 different Indian chutneys and sauces, sold at Costco, Loblaws, Sobeys, Metro, Longo’s and No Frills. The family factory, located in Mississauga, can produce 400 cases a day. It is almost entirely automated. The company employs eight people in all. The cooking sauces – add to cooked meat or vegetables, simmer and serve – retail for about $4.29 for 375 ml, which serves 3-4 people. The chutneys and dipping sauces retail for about $3.29 for 455 ml. Last year – the first year the family had their own factory – sales of KFI products grew 300 per cent. This year sales are up 40 per cent. The Katarias are leading a wave of new innovators in the market for ethnic foods, balancing the tastes of home with the taste buds of second-generation offspring and Canadians who are becoming increasingly sophisticated when it comes to new flavours, foods and recipes. They don’t just want to eat ethnic food in restaurants. They want to make it at home. The result is an increase in the assortment and availability of ethnic convenience foods at grocery stores of all kinds and through general merchandise retailers like Costco. Anthony Longo, president and CEO of the eponymous chain, says an increasing number of customers of all backgrounds are asking for international sauces. One of the best-selling sauces at Longo’s is Sriracha sauce from Thailand. And items that were once considered specialty items, like wet Asian greens including Bok Choy, have hit mainstream. According to Nielsen data gathered for Canadian Grocer magazine, the ethnic shopper is one of the fastest growing consumer groups in Canada. The largest and fastest growing groups include: Chinese, Filipinos and South Asians, which includes people from India, Bangladesh, Pakistan and Sri Lanka. By 2031, 3.6-million South Asians, 2.7-million Chinese and one million Filipinos will call Canada home, according to the data, published in the April edition of Canadian Grocer. “Every time they come here, they bring their food. It doesn’t take long before people who have lived here all their lives start sampling their food,” says John Scott, president and CEO of the Canadian Federation of Independent Grocers. The trend has driven existing grocers to stock their shelves and prepared food aisles with more and better ethnic products, including somosas and sushi, Scott points out. So-called ethnic grocery stores, including Oceans Fresh Food Market, Nations Fresh Food Market and Galleria Market are stepping up their game with bigger and better stores. Loblaws got into the market in a big way with the purchase of the Asian food grocery chain T&T in 2009. “It’s probably the most competitive market to compete in. Everyone wants to start a food business and you’re competing with multinationals who can replicate a product in months. Fortunately, they don’t know what good Indian food tastes like,” says Rishi. The first 18 months were a constant hustle for the Kataria family, as Rishi, an MBA, his father and his brother Raman, 30, an IT professional, schlepped boxes of cooking sauces and chutneys around town, hoping independent Indian grocers would buy a few at a time. “There we were, three educated people chasing $50 here and $50 there, and you have to do it because it all adds up,” said Rishi. It got them some attention. When they began pitching to the big boys – Loblaws and other chains, they had some recognition. Although the idea was born in 2006, things didn’t start taking off until Rishi jumped into the business. With a bachelor of science in biology and an MBA in innovation and new technology from McMaster University, Rishi was on the fast-track at BMO, working in the fraud-containment department. He was ready for a bigger challenge. He had watched his mom start and run her own business, an ERP software design firm she still runs today, called Hitek Computer Systems. Rishi also provided the frontline Canadian taste-test audience, and still does. He had the last word on the butter chicken cooking sauce, which has become a best-seller for the family. Now he and his wife Mohita do the taste-testing until they’re confident enough to try new recipes out on friends and neighbours. “I’ve tasted a lot of butter chicken. Even before we got into this business we ate butter chicken all the time. When it comes to building our own, I knew what I wanted in a butter chicken. It needed to be more sweet than spicy,” said Rishi. The Canadian factory is HACCP compliant to ensure proper food safety management, which gives the products an edge over competitors from abroad where the standards may not be as trusted by Canadians, says Rishi. 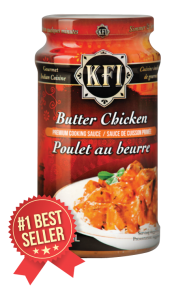 Kiran told Rishi that her dream was for KFI sauces to be the Heinz of Indian food. “We’re not going to be the Indian Heinz. We’re going to be the Indian Kraft,” he told her. The first time he saw their sauces next to Heinz ketchup on grocery store shelves, he took a picture with his smart phone and sent it to her. “It’s definitely an underserved market,” says Asim Qureshi of Tandoori Oven, who, like Rishi, is a second-generation innovator. Qureshi’s father, Ayub Qureshi, opened the first Halal store in Ontario in 1971, which still operates as Qureshi Foods at 1879 Lawrence Ave. E.
At the recent grocery innovation show at the Metro Convention Centre, Qureshi handed out samples of the family’s newest product, Tandoori marinated chicken, beef and lamb. To prove how easy the product is to cook, Qureshi cooked his Tandoori Oven marinated chicken breast in a toaster-oven. At 350 degrees, it was ready in 14 minutes. The food has to be fast, says Qureshi. Consumers lack the time and the knowledge to develop the flavours at home. The product generated high interest among the independent grocers at the show, said Qureshi, but he has yet to make a deal with any of the big retailers. Tandoori Oven marinated chicken legs and chicken breasts retail for about $14-$25 a kilo, the Tandoori beef retails for $17.60 a kilo and marinated Tandoori lamb chops for $31 a kilo. Qureshi thinks the product has a bright future.